Acclaimed street style photographer Scott Schuman also known as The Sartorialist, has ventured out from behind the camera's lens this season to create a 70's inspired capsule collection with leading Italian denim brand Roy Roger's. Presented at Pitti Uomo 89 in Florence ahead of Milan Fashion Week, Schuman talked about how the fall-winter 2016 designs were "almost selfish", being items he wanted only for himself to wear. His girlfriend even joked that he looks taller as he wore his collection's high-waisted jean's, a signature cut present across the collection which is entirely made in Italy. Initially, the collaboration between Roy Roger's and The Sartorialist was meant to be strictly denim, but quickly grew to include more items such as jackets and sweaters. 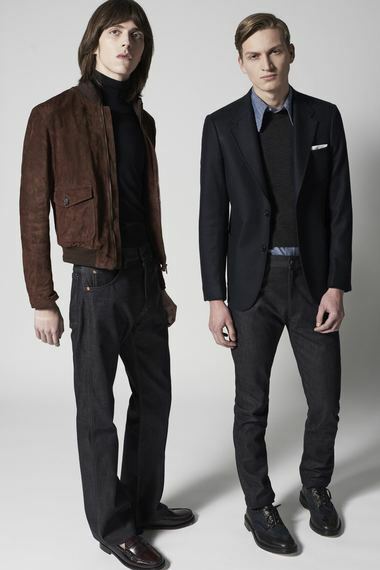 As seen on the left, sweaters were made slightly cropped, a look working so well that it led one to question: why hasn't this trend blazed into menswear more ? With Beatles-esque haircuts and casual chic silhouettes, models helped bring to life a well-rounded collection that is sure to be timeless.
" We signed a contract for two collections. So this is the first, the next one will come out in June. But if it goes well we will keep doing it. But you know these guys [Roy Roger's] are easy to work with. The reaction so far has been very good so I could see it becoming an ongoing thing," he added. Will The Sartorialist turn into a full-time fashion designer ? Not just yet. "Just more going out and shooting. That's the thing I still love to do. You know the design is fun to do. I love doing stuff like this because it keeps my brain challenged. But at the end of the day, I like to just go out and take photographs," Schuman explained. "I have always been attracted to Scott Schuman's pioneering vision of fashion and to the way he catches people, interpreting it and making it personal. The Sartorialist, in fact, is a constant lens on trend changes around the world: through his alert eye, he reports how people dress up during their daily lives. Having the street as a fundamental inspiration is a point in common with Roy Roger's: this is also where I always start from when I'm designing a collection. Trends take a shape from our day-by-day reality," Biondi said. A man who knows how to create beauty through pictures and clothes is certainly a man to watch.